Created by multiple artists, the African Crucifixion was made for the Cathedral of the Holy Nativity in Pietermaritzburg, South Africa. 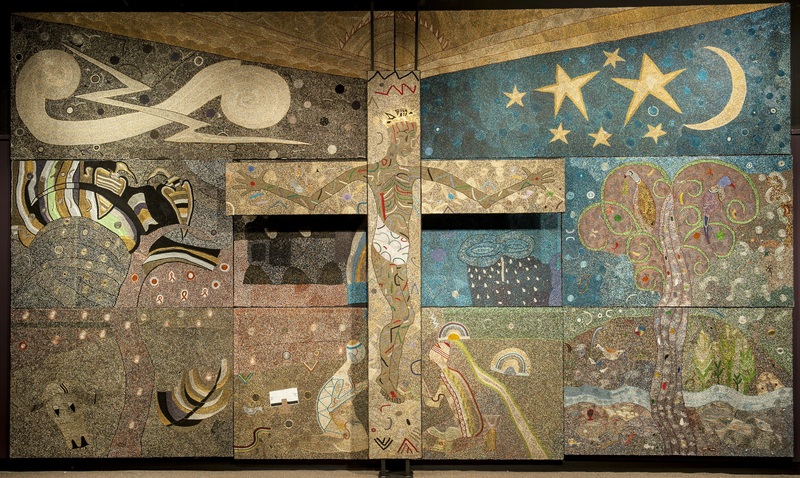 Comprised of seven panels of glass beads sewn onto fabric, this contemporary representation of the Crucifixion shows a dark-skinned Jesus, depicted in the stylized lines, bright colors, and bold shapes of indigenous South African art. In contrast to the other images in our Lenten series, this one shows a kingly Christ, wearing a crown and with a regally painted face, surrounded not by an angry mob, but worshipped by adoring figures. Around him, all creation - sun, moon, stars, animals, and plants - celebrate his triumph over death. “Ubuhle,” the Zulu word for “beauty,” captures the perfection of what he accomplished on the Cross. What in your life feels unfinished or incomplete? What does Jesus declaring, “It is finished!” mean to you? In what ways have you sought to add to or improve upon Jesus’ work in your life? Ponder what Christ accomplished on the cross for you, for the world, and for all of creation. Is there any area in your life where you feel God’s reign and power are not adequate or have not yet taken hold? How does the reality of Christ’s victory over sin and death invite you to change the way you live and love? What does it mean for your fears and struggles? For your hopes and dreams? Jesus, hold now my broken and fragile life in your loving hands- hands that held the universe, hands that were pierced for me and for the salvation of the world. Grant that I might rest my faith in nothing else but your finished work on the cross. And until you return, may I cling to the hope only you can provide. In the name of Christ, my Savior and King, I pray. Amen.